An accident caused the death of one Detroit Fireman and injured 8 others. At 3:23 am, Hook and Ladder Company #5 was called to a fire at 1036 St. Aubin Avenue, Box 273. The regular driver was on leave and Ladderman Anthony Kort took his place. After extinguishing the fire and picking up, Ladder 5 headed back to their station shortly after 4 am. They crossed the Detroit, Grand Haven & Milwaukee Railroad tracks at Canfield Avenue. A careless watchman had been taken ill and had to leave his post. He neglected to lower the crossing gates before leaving. The rig was struck by a locomotive. Crew members later stated they had not heard a locomotive whistle or bell that would have indicated the train was approaching. The truck was pushed against the train’s freight cars and dragged about 90 feet. It was then thrown from the tracks, coming to rest about 150 feet away. Ladderman Anthony Kort, Steersman Christian Geobel, and Lieutenant Charles Chase, had been thrown from the truck and knocked unconscious. It was dark out and the rest of the crew searched frantically to find their fallen brothers. Kort was the first to be found lying beside the tracks, face covered with blood and almost lifeless. Chase was found near the south side of Canfield having been thrown over 30 feet away. Goebel was finally located and the three were taken by ambulance to Harper Hospital. Geobel and Chace regained consciousness shortly after being found. Luckily their injuries were not life threatening. They both had several cuts on their heads and backs as well as severe bruising. At the hospital it was discovered that Ladderman Kort had been impaled in the cheek about 2 inches below his eye by a tine from one of the ladder company’s pitch forks. Ladder companies carried pitch forks to throw out hay from barn fires. The 6 ½” tine had broken off the fork. When doctors removed it they found that it had penetrating Anthony’s brain. Six other members of the crew, which included Captain M. F. W. Wirth, were less severely hurt but also cut and bruised. The fire horses that pulled the truck (McDuff and Mooney) were so badly mangled they could not be saved. Ladderman Kort’s condition stabilized about a week after the accident. He was released from the hospital, but shortly after took a turn for the worse and returned to Harper. Anthony passed away on May 17th, 1895. 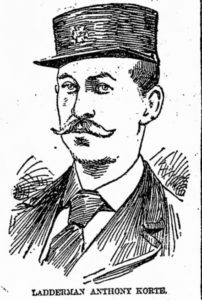 Ladderman Anthony Kort joined the department on September 1, 1890. He served all but 9 month of his time on the job at Ladder 5. At the time of his death he held badge number 257. Before joining the department Anthony was a laborer, teamster, and cigar maker. Ladderman Kort was 25 years old. He was buried by the department with full firemen’s honors at the Lutheran Cemetery. 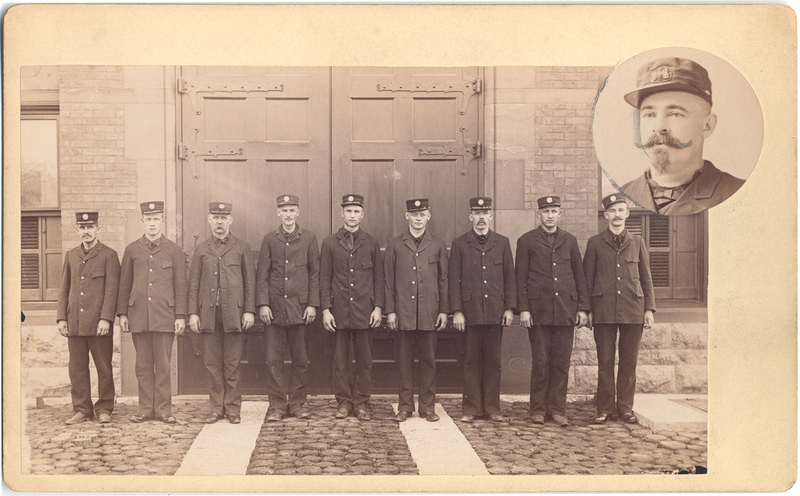 Members of Hook & Ladder Company #5 in 1894. Insert Captain M.F. W. Wirth. Anthony was survived by his wife, Mary (Gillman) Kort, and 2 sons, Anthony and Stanley. The day he died was the couple’s sixth anniversary. 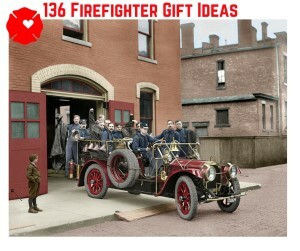 After his death Mary was awarded a pension of $300/year by the fire department. Eventually Mary brought a lawsuit for wrongful death against the railroad company. It was settled for $5,000. The fire commission also asked the railroad company to pay for damages, in the amount of $1,102.67, for the repairs to Ladder 5. In 1902 Anthony’s widow remarried. 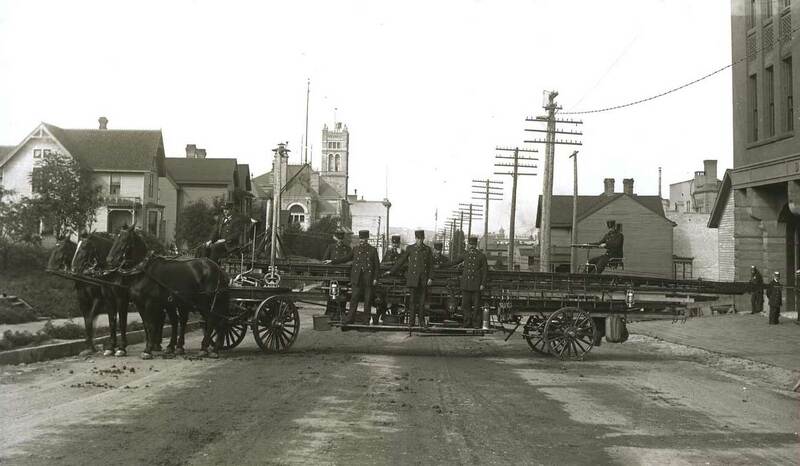 She was wed to Jacob “Jake” Van Coeverden, who was also a fireman and with her new marriage she was dropped from the Fire Department’s pension roll. Widows who remarried were no longer eligible to receive a widow’s pension. Ladderman Kort’s son, also named Anthony, joined the department in 1903. He became the youngest motor engineers the department had and served in the Army Corp of Engineers during WWI. Returning to the department after the war, he eventually became a member of the Arson Squad. After 35 years of service he retired and moved to Florida.